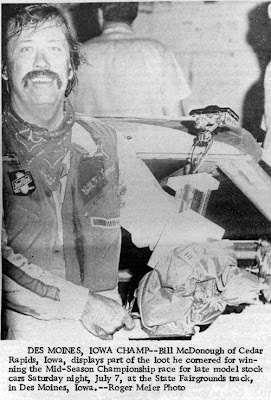 1990 – Wayne Lodholz of Wausau, Wis., held off Rudolph’s Tom Reffner in the second half of the 76-lap Central Wisconsin Racing Association (CWRA) late model feature at Dells Motor Speedway in Wisconsin Dells, Wis., on July 7. Lodholz’s feature win, his second of the year on the 1/3-mile asphalt, was the headliner for the annual “Escape to Wisconsin Classic”. Reffner made several spirited attempts to pass Lodholz in the latter circuits, but Lodholz’s defensive driving proved too much for Reffner to handle. Steve Holzhausen of Bangor closed in on the leaders towards the end of the contest to take a very close third, just ahead of CWRA point’s leader Tom Carlson of Lacrosse. 1984 – It was a pub brawl in Beertown and Jim Sauter was the last man standing, taking a hard-fought victory in the ASA Sliver Creek-sanctioned Miller 200 at Wisconsin State Fair Park in West Allis, Wis., on Sunday afternoon, July 8. 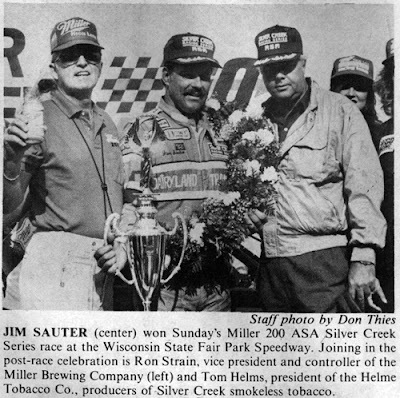 A crowd of 27,000 watched Sauter’s Dairyland Transport Firebird finish a scant one second ahead of Alan Kulwicki’s Hardee’s Firebird that saw a record 16 cautions but a like number of cars battling on the lead lap at the end of the race. Just fractions behind Sauter and Kulwicki were Mike Eddy in third, Bob Senneker taking fourth and Rusty Wallace rounding out the top five. 1979 – NASCAR star David Pearson showed Iowa fans at Golden Hawk Speedway in Mason City that he could get around a half-mile dirt track just as easily as a high-banked superspeedway as he made a special appearance on Sunday night, July 8. 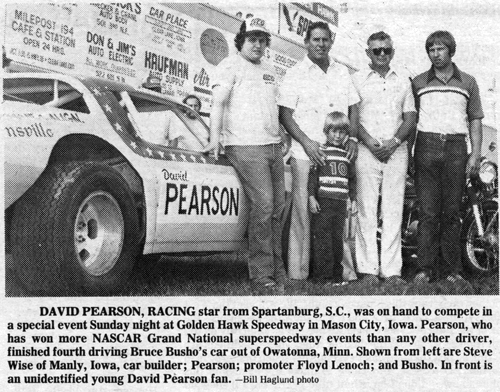 Pearson, driving Bruce Busho’s late model out of Owatonna, Minn., started the feature last in the 17-car field, but worked his way steadily towards the front before settling for fourth in the 35-lap late model main event. Out front at the checkered was Mike Niffenegger of Kalona, Iowa, followed by Bill Rice of Des Moines and Kenny Farrell of New Hampton. 1973 – Bill McDonough of Cedar Rapids, Iowa, made an astonishing recovery after totaling out his ’65 Chevelle just nights before, by coming back on Saturday, July 7, to win the 35-lap mid-season championship for late model stock cars at the Iowa State Fairgrounds in Des Moines before 8,888 race fans. McDonough totaled his racecar in Oskaloosa on Wednesday night, July 4, careening into the guardrail on the backstretch and rolling several times. The leader in the point standings at the midway break in the season, McDonough started on the pole and led from green to checker in the contest. Stan Stover of Reinbeck, Iowa piloted his 1972 Nova to second place while Bill Wrich of Kennard, Neb., took third driving his ’71 Monte Carlo.